Duncan Little Theatre's presentation of the acclaimed musical production "Into The Woods" offers a unique VIP Experience at The Simmons Center Theatre in Duncan, OK. Available one night, with limited VIP tickets and only on February 24th, 2017 make reservation now for a memorable VIP Experience with Duncan Little Theatre..
DLT offers a VIP experience to their production of "Into The Woods" on Feb 24th, 2017. 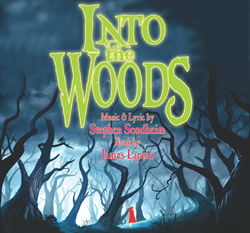 Duncan Little Theatre’s presentation of Stephen Sondheim’s "Into the Woods" opens February 17, 2017 at the Simmons Center Theatre and will perform Feb. 17/18th and 24/25th. The musical debuted on Broadway in 1987 and ran for 764 performances, garnering many awards during its initial Broadway run including Best Actress in a Musical and Best Original Book and Score. "Into the Woods" is a musically sophisticated show and one of Sondheim's most popular works. The story combines familiar characters from childhood fairy tales such as Cinderella, Little Red Riding Hood, and the ubiquitous Witch, and explores their journeys to get their wish, as well as the negative consequences of the small dishonesties committed by each character to get what they want. For the first time ever, Duncan Little Theatre is bringing a VIP Experience to our patrons- one night only, February 24th. As a VIP, enjoy a backstage tour hosted by the director, Veronica Hodgson and a Q/A session with members of the cast. Each VIP Pass allows the participant exclusive access to their choice of seating and also includes a gift bag filled with a DLT VIP lanyard, water, sweets, a souvenir mask and a Distinctive Decor gift card. The VIP Experience tickets are first come, first served and will be limited to 15 tickets only. Each ticket is $40, which includes admission to the show and must be purchased in advance. The production runs February 17/18th and 24/25th, Friday and Saturday evenings, at 7:30 pm. at the Simmons Center Theatre - located at 800 Chisholm Trail Parkway in Duncan. Duncan Little Theatre recommends to the audience the following ratings for "Into the Woods". Act 1 is rated General and Act 2 is rated PG-13. Ticket prices are $20 for adults, $15 for seniors/military/students. For VIP ticket information, please call Jerri Lynn Freeman at 580-736-5484 or brocksmom1(at)sbcglobal(dot)net. VIP Experience tickets, as well as standard tickets, may be purchased online at http://www.duncanlittletheatre.com.